I hope everyone had a wonderful labor day weekend. I know I needed it. I will be going on vacation to visit family in St. Louis in a few weeks so work is going to be a bit rough leading up to that. I took some time out of my relaxing weekend to fire up an Illusione *r* Rothchildes. 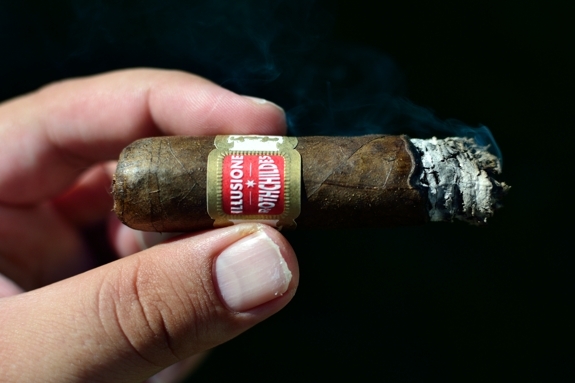 The Good Stuff: In case you have been living under a rock the Rothchildes are the latest release to come from the hands of Dion Giolito over at Illusione Cigars. 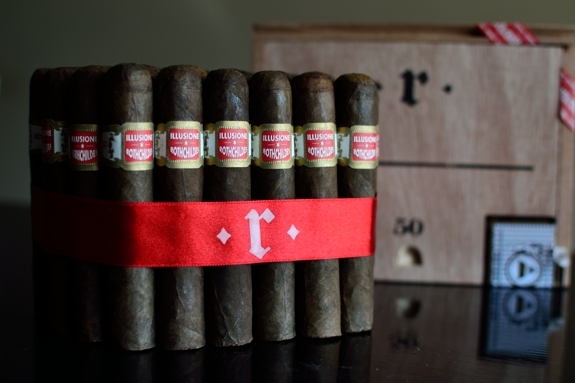 The Rothchildes release is the first value cigar to come from Illusione in some time. 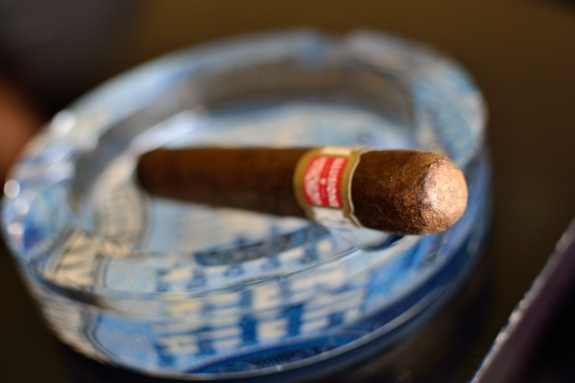 That is, if you consider the Chuchillos Cubanas a value cigar. Either way, it’s a welcome release. The Rothchildes, unlike some of Dion’s releases are being made at the Tabacos Valle de Jalapa S.A. in Esteli. This factory is ran by Eduardo Fernandez, the man behind Casa Fernandez. I read recently that Dion was considering shifting operations to another factory so this must be it. 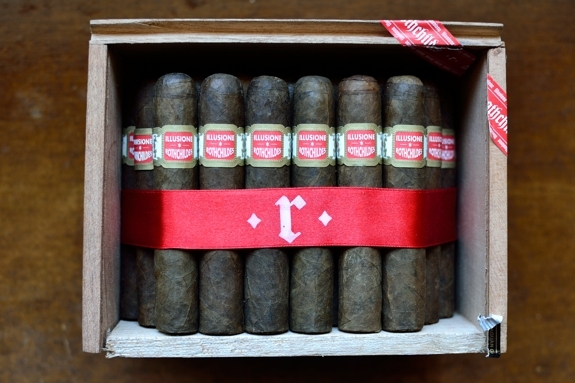 The Rothchildes release will only be offered in one Robusto style size (4.5 x 50) and will run $3.99 a cigar or $199.50 per cabinet of 50. Very easy on your wallet. The Blend starts out with a Mexican San Andreas wrapper (which have been popping up more and more as of late, and is a GREAT leaf when blended correctly), with a Nicaraguan Binder and Filler. 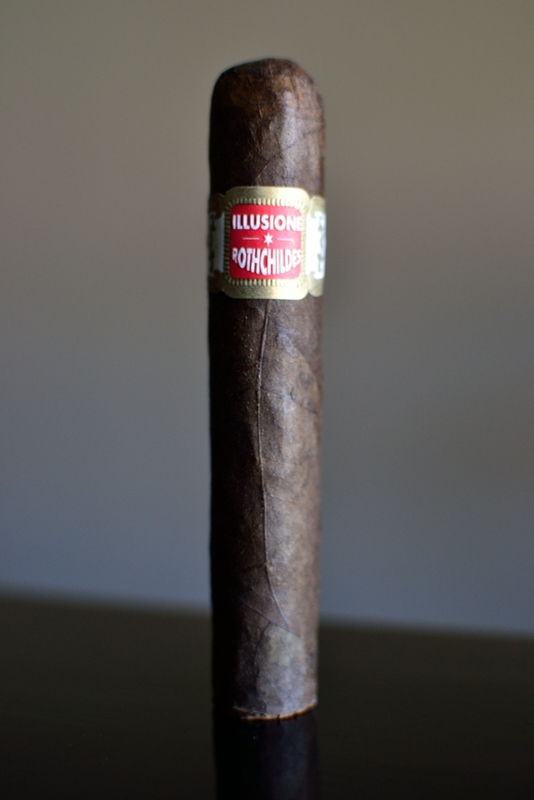 Prelight: Illusione’s Rothchildes isn’t much to look at, but that doesn’t mean it’s not a beautiful cigar. The wrapper is a natural, dark and medium brown color with lots of spots of black and orange. I love the rugged look and again, I am extremely fond of anything that showcases the natural characteristics of the leaf. The wrapper is very firm and thick with some decent tooth and lots of oil. There are a few smaller veins running throughout the body up to the round triple cap. The Rothchildes is polished off with a beautiful gold, red, and white retro-style Cuban band that simple states “Illusione”, “Rothchildes”, and “Nicaragua” in the back. I love the design on these bands. 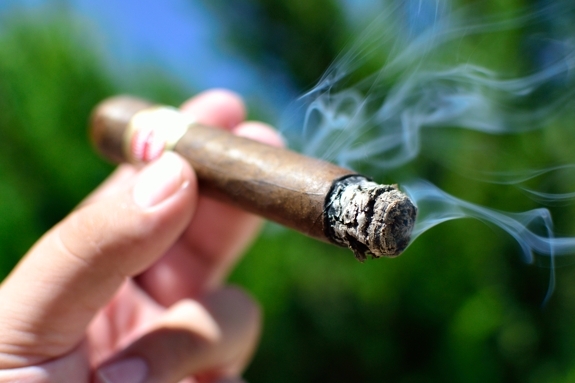 The cigar is very heavy for the size and is rather firm with the exception of the softness around the foot area. 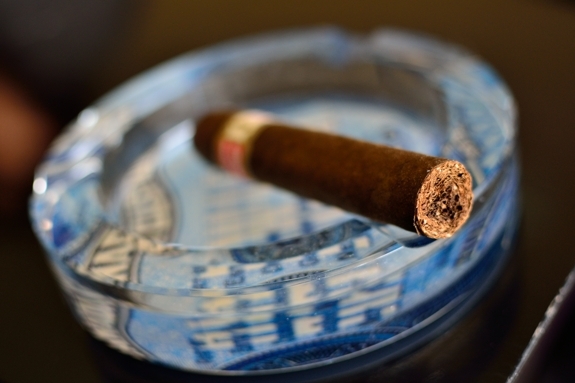 Where this cigar lacks in looks is makes up in aroma as the wrapper of the Rothchildes boasts tons of sweet tobacco and spice with the foot carries some pepper and sweetness. The cap cut clean and easy using my Palio double bladed cutter. I really wish that more companies would utilize the triple cap technique. Adding that extra layer really increases the changes of a clean cut. Anywho, the cold draw is much like the prelight aroma boasting a ton of sweetness, tobacco, and spice. 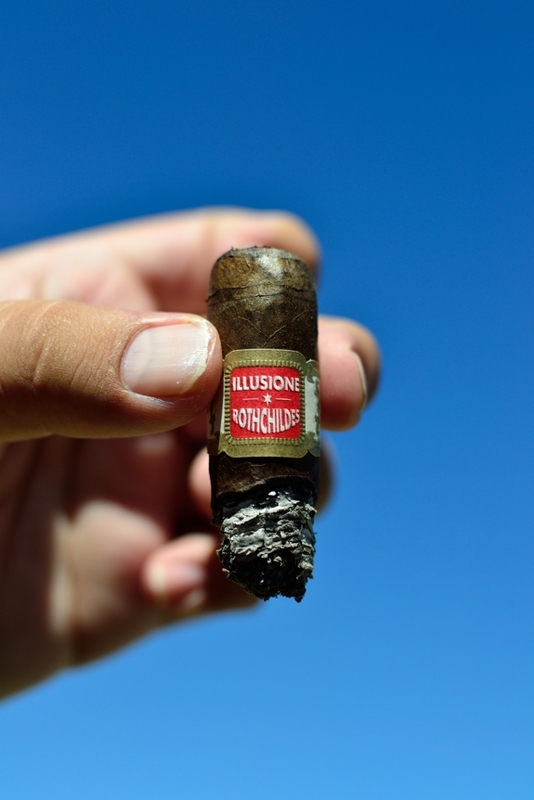 First Smoke: Illusione’s Rothchildes starts out with a nice black pepper blast which quickly fades away leaving behind a whole ton of sweet, sweet tobacco with some nice cinnamon and spice along with some black cherry and chocolate. There is a whole ton of flavor from this cigar right off the bat. The draw on this beefy little cigar is stellar. Seriously, it takes only a minor puff to get a mouthful of thick, white smoke. The burnline is a bit messy, but nothing that needed any attention from my lighter at this point. The ash left behind is a light and dark grey, but very flaky. It only held on for about ¾ of an inch before falling into my ashtray. Halfway There: The pepper has now completely faded from the Illusione Rothchildes experience. The sweetness is still rocking the flavor profile alone with some cedar, a ton of spice, and the black cherry laid over natural tobacco. I really enjoy the flavors in this stick. It’s worth mentioning that the cigar does produce a bit of a chalky after taste which is quickly taken care of with a swig of my beer or another puff from the cigar. The retrohale really showcases the sweetness and the cherry that I mention in the experience and I find myself retrohaling this cigar a bit more than normal due to the pleasurable flavors. The burnline is burning thick, but completely solid at this point as I am feeling absolutely nothing in the nicotine department. 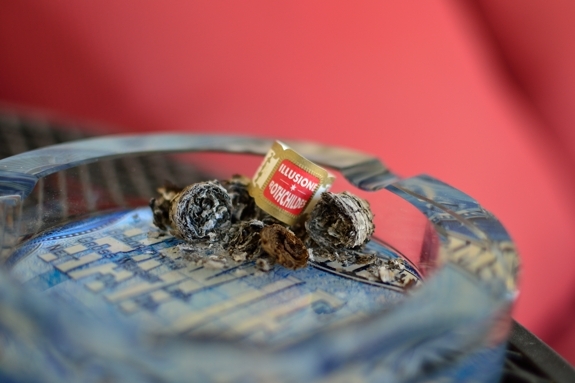 Finish: While the Cherry and a bit of the sweetness has started to fade from the experience the cedar and natural tobacco have really ramped up in the final third of Illusione’s Rothchildes. I’m really impressed with how slow this cigar burned as it took me almost an hour and a half to take down the little guy. I am also impressed at the fact that even in the final inch there wasn’t a single sign of harshness at all. The cigar finished off smooth, and only a bit warm on my fingertips while requiring absolutely no extra attention from my torch. I left the experience feeling absolutely no nicotine whatsoever. Overview: This is a great stick. I am a HUGE fan of most anything that Dion has produced and I think that the Rothchildes fills a huge gap in the Illusione portfolio by offering a great experience at a value price. I had to admit, I was a bit apprehensive at first due to my love for his other blends such as the ~88~ and Epernay. He is a stickler for quality and flavor so the thought of him releasing a value cigar made me a bit uneasy as I thought it would be something unlike his other blends made solely for people wanting to smoke his cigars but not pay the price. But I am happy to report that this cigar doesn’t taste any “less expensive”, nor does it wonder too far from the work he’s been doing on his other blends. It’s pretty complex for what it is and offers up a ton of rich, bold flavors while carrying great construction, and burn. This is a damn good cigar at a price that just cannot be beat. It’s not wonder why retailers are having such a hard time keeping these cigars on their shelves. Personally, I don’t think this cigar as a “value” stick in terms of flavor and experience. It’s probably way up there with the likes if the ~88~ in my opinion. The price just adds to how phenomenal this cigar is. To Sum it Up: The Rothchildes come boxed in cabinets of 50 and I urge just about anyone to pick up a whole cabinet, you won’t regret it. The huge flavor profile an complexity is perfect for seasoned cigar smokers, especially those already fond of Dion’s work, while the excellent price tag and mildish strength will really entice novice cigar smokers to pick them up as a introduction to the world of a higher-premium cigar. Pairing: I decided to pair this with a bottle of Magic Hat’s infamous #9. This “Not Quite Pale Ale” is brewed at the Magic Hat brewery in Vermont and clocks in at 5.10% ABV. This is a wonderful summertime session beer as it’s one of the smoothest beers I have ever had. It’s so easy to find yourself knocking a few of these back in quick succession. What I like about the beer is while it’s smooth, it offers a neat mix of citrus and malt flavors with just a touch of pine. While a bolder beer would have matched up well with the Rothchildes I decided to toss this one in since I knew that the pine and citrus would marry up wonderfully with the spice, sweetness, and cherry that the cigar had to offer. Not to mention it’s hot and humid as hell outside right now and drinking a heavier beer just didn’t match up with the weather. 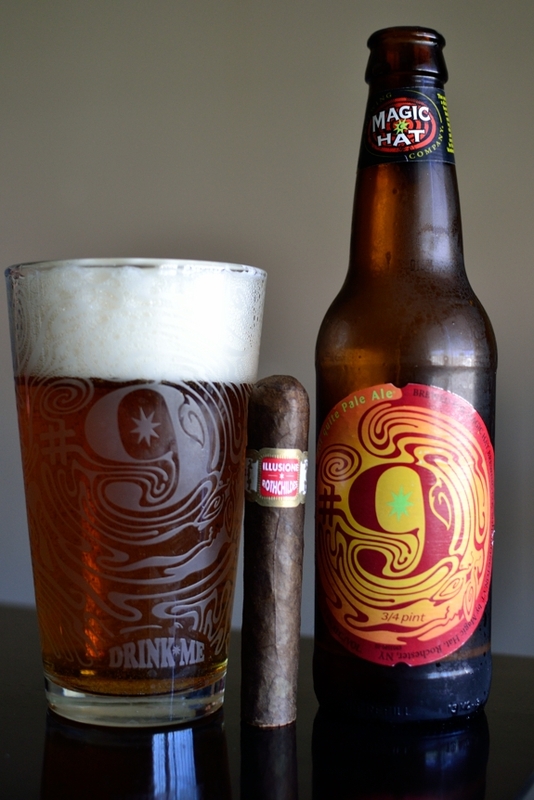 I could easily see myself pairing this cigar up with some bold Dopplebocks, or Brunes during the wintertime. Awesome man! I’ll toss a couple of these on the list. Any other must-see attractions? I know we are watching a game at Busch Stadium as well as hitting the brewery. I’ll stop by some of these microbrews and cigar bars for sure. Great review, and it makes me want to go buy some now. The vitola looks like just my size for an afternoon smoke or maybe an AM time with Coffee..
I’ll get some over to ya bro! Jeremy and I are putting together a care package for ya shortly. Okay, I need to find some of these. 🙂 Maybe santa will bring you some! Where can theses be bought? I can’t seem to find them in stock anywhere . Check with Bonita Smoke Shop, Serious Cigars, or Smoke Inn. They all should be able to let you know online if they are in stock or not. I can’t find these anyplace I’m dieing to give them a smoke!!! Exactly my thoughts. Right now my drive home rotation is Verocu 5, Illusione Rothchildes, and Tatuaje Petite Cazadores. You can’t beat that.